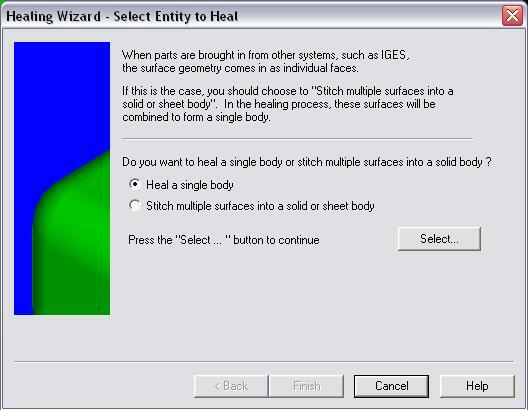 Specify whether to heal a body, or stitch multiple surfaces into a solid or Surface. Use the SELECT button to indicate the body, or surfaces, you intend to heal. Heal a Single Body – Allows you to select and heal a single body using either Automatic or Interactive healing. Stitch Multiple Surfaces into a Solid or Surface – Allows you to stitch multiple un-stitched surfaces into a solid or surface.